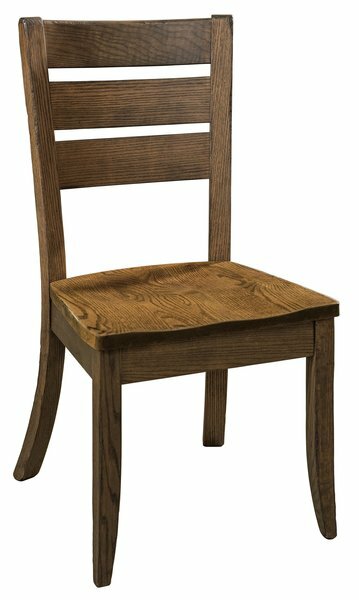 Let the Amish Savannah Dining Chair take shape in your dining room. This contemporary design is a popular one with strong lines and a smooth profile that will stun in your dining room furniture collection. With wide horizontal back slats and curved and tapered legs, the Savannah is a dining chair that will enhance your dining room collection with ease. Contemporary furniture like the Savannah Dining Chair offers a dynamic design that adapts well to changes in your dining room display. The Savannah is shown here in brown maple wood with dark brown stain. Brown maple wood displays a dark stain beautifully and looks magnificent in chocolate or cherry tones. Consider the matching Amish Savannah Swivel Bar Stool to enjoy this style throughout your kitchen and dining room. Amish made furniture offers you options. We make it a goal to be sure you create the dining room furniture you are dreaming of. Please call one of our Amish Furniture Specialists today, toll-free at 866-272-6773 with any questions or visit our DutchCrafters Furniture Store in Sarasota, Florida to experience Amish made furniture in person. Chairs shown in Red Oak with Distressed Weathered Grey stain. Seats shown in Almond stain.